(PRESS RELEASE) – Emirates’ iconic A380 aircraft will make a one-off landing at the Bandaranaike International Airport (BIA), Katunayake, on Monday 14th August as the global airline joins local authorities in the celebration of the airport’s resurfaced runway. The special flight, operating as EK654 from Dubai, will be the first A380 aircraft to disembark passengers in Sri Lanka after completing a commercial service. The one-off A380 aircraft will arrive at 16:10 hours and be on ground for more than six hours before it returns to Dubai as flight EK655 departing at 22:10 hours, enabling airport executives, VIPs, trade partners and media to enjoy a guided static tour of the double-decker aircraft. “Colombo has welcomed us from the day Emirates commenced daily flights from Dubai in 1986, just a year after the airline launched its operations. We are honoured to work alongside the city, airport, and the Sri Lankan Civil Aviation authorities, to bring our flagship A380 to this vibrant destination. For BIA and for aviation enthusiasts in Sri Lanka, this will certainly be a special day and we look forward to showcasing our unique on board products in this market,” said Ahmed Khoory, Emirates’ Senior Vice President, West Asia and Indian Ocean. Customers in Sri Lanka can experience Emirates’ double-decker aircraft by connecting through the airline’s Dubai hub to more than 45 A380 destinations. With its quiet cabins, on-board lounge and shower spas in premium cabins, Emirates’ A380 products and services are unparalleled in the industry, giving all our passengers on board an unsurpassed travel experience. As the first and only airline in the world to operate a fleet of all Airbus A380 and Boeing 777 aircraft for its passenger flights, Emirates’ operating fleet remains modern and efficient while offering customers a high level of comfort. Since 2008, Emirates has flown over 80 million passengers on its A380 fleet. 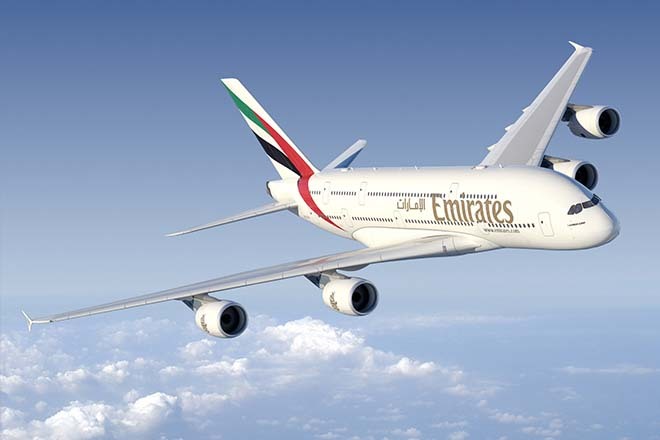 Emirates commenced operations to Sri Lanka in April 1986 and operates a total of 34flights a week from Colombo — 27 flights westward to Malé and Dubai and seven eastward to Singapore connecting onwards to Melbourne, Australia. The airline has deployed ultra-modern Boeing 777-300 ER aircraft on scheduled flights serving Sri Lanka.